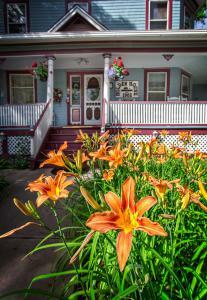 Holden House is a special place to stay anytime of the year! 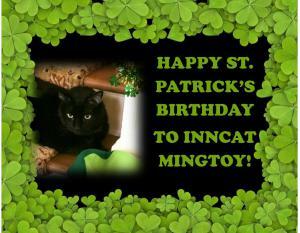 It's InnCat Mingtoy's 11th Birthday and she's offering you a St. Patrick's Birthday gift all through April for Holden House guests! 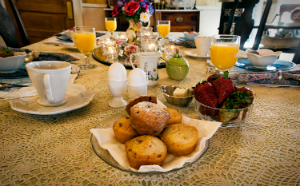 COLORADO SPRINGS, CO, UNITED STATES, March 17, 2019 /EINPresswire.com/ — At Holden House 1902 Bed & Breakfast Inn located in Colorado Springs, it pays to say, "Happy Birthday Mingtoy" all through the month of April to celebrate InnCat and Holden House' mascot Mingtoy's 11th birthday, which just happens to coincide with St. Patrick's Day. This beautiful all black green-eyed shorthair cat was born in 2008. Her mother was abandoned in a cardboard box and dropped in the parking lot of the local veterinarian's office. The next day, on St. Patrick's Day, her mother gave birth to a litter of kittens and little Mingtoy was among them. Holden House' Mingtoy is from a long line of rescue cats adopted by the Clark's over the years, and she is the sixth with the same name. Innkeeper Sallie Clark's first cat Mingtoy was given to her when she was a child and the name continued for subsequent black kittens over the years. As her Welsh grandmother would point out, black cats are considered good luck in Wales.